I am back!!!Annyeonghaseyo!! I celebrated my 29th birthday in Seoul, South Korea. I spent 5 days and 5 nights in that beautiful country. This is the grandest birthday gift I have ever given myself. Now, I know why travelling is addicting. waaahh Gusto ko pa!! The above photo was taken at Myeongdong. 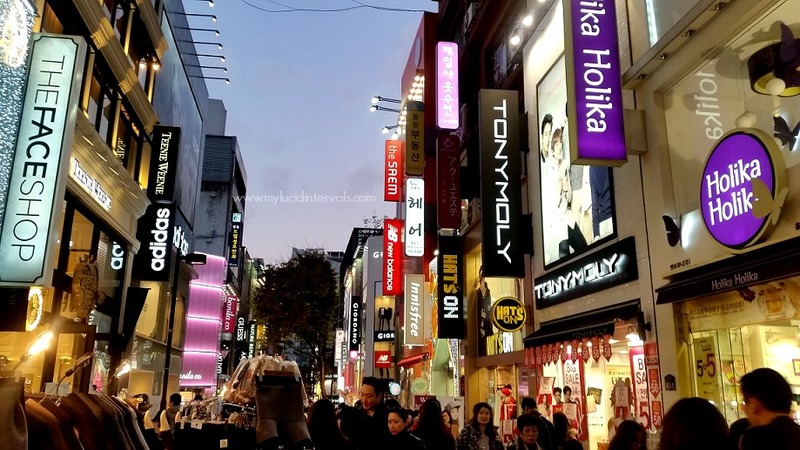 The famous shopping district in Seoul. I have never seen a street filled with makeup stores in my entire life. And as all of you may have guessed, I went gaga crazy. Haha My Fiance gifted me a shopping spree treat and But guess what? I got frustrated when we went to Ehwa University because there is this Korean Brand, ONL that has an ongoing sale of buy 1 take 2!! I can't believe it!! I spent almost all of my won on Myeongdong and Ehwa is better because there were fewer people (less stress at pagkahilo). Also, I found this outlet store where they sell Korean brands from high end ones like Hera, Sulwhasoo to Etude House with a very good discount price. Like 50-70% off! Nakakaloka!Waaah!! Ang laki ng pagsisi ko! :( Anyways, if ever I had the chance to go back, I will definitely check Ehwa University first more than Myeongdong. Tony Moly had a two or three day sale. I got two items in Lotte Plaza Cheongyanggi, two from Tony Moly Myeongdong and one from Ehwa University. 1. Tony Moly Circle Lens Mascara - I got this for 2750 won (I think) Only 117 pesos when converted to peso. The next day I immediately used it and fell in love with how the green one made my lashes longer so I got another one in pink. 4. Tony Moly Luminous Goddess Aura Makeup Mist - I got this because gusto kong maachieve that Korean dewy skin look. hehe I got this on a really good bargain. This was not on sale in Tony Moly STores in Myeongdong but like I said I visited this outlet store in Ehwa and I got this for 3900 won or 169 pesos!! In Myeongdong, this costs 8000 won. 5. Tony Moly Gel Liner - I forgot to mention this one. This is on sale for 4200 won or 182 pesos. 6. A'pieu - One of the brands, I wished we had in Manila. I just wanted a lip and cheek tint for my birthday but I got more than what I wanted. I got this cheek tint in the shade red first because I am not sure of the quality. What caught me was its price tag of 4500 won or 195 pesos. The next day, I immediately tried it on and it stayed put! I got another shade in Pink which I equally love. 8. Nature Republic Hawaiian Clay Pack - I was set on buying the Innisfree Jeju Volcanic pact but it was not on sale so I settled for this one. This only costs 5000 won or 217 pesos. I also saw that it won an Allure Beauty Award. 9. Palgantong Gold Rush Makeup Base - When I saw this at Seatree shop, I immediately thought of the infamous Palgantong Powders sold online and at PureBeauty. Correct me if I am wrong but are they of the same brand as the ones sold in PureBeauty. If my memory serves me right, that brand is quite pricey. I bought this at 7000 (Base) or 304 pesos. This is a golden liquid highlighter. As I have said, peg ko yung shiny fez ng mga Koreans so I bought this one. The bottle is quite huge and it has a pump which other liquid highlighters lack. 11. Holika Holika Jewel Light Waterproof Eyeliner - One of the cheapest and nicest eyeliner I have ever tried. I got these on sale for 3950 won or 171 pesos each. 12. Iope Lip and Cheek Stain - Iope is one of my most favorite buys in Korea. I should have gotten more of their products because they are really good. I got this in Ehwa at a very very nice prie of 2000 won or a whopping 87 pesos!!! Waaahh!!! They only sell one shade. 13. Iope Essential Oil - I got this on a whim because my skin acted really negatively in Korea. Their extremely chilly weather triggered my rashes and my face looked horrible sans bb cream and concealer. This oil was heaven sent!It relieved my skin of bumps, itchiness and redness. I absolutely love this oil!!!!! I should have gotten a back up (I know ang dami kong pinagsisihan!hehe) This only costs 7900 won or 343 pesos. I love how it hydrates my skin and the moisture truly penetrates my skin making it supple and softer. 14. A'pieu Snail Vital Eye Cream - I was complimented by a Korean SA (char!! Salamat sa makeup at sa malaki kong mata). However, she mentioned that I have prominent under eye lines. Kaloka!! I was really conscious after that so, I got this eye cream. I was never fond of using eye cream but I think I should take my lines seriously from now on. This is on sale at 10000 won or 434 pesos. 15. ONL Lipsticks - This is the brand that I saw in Ehwa that had an ongoing sale of buy 1 take 2!!! Bakit ba ako nagdalawang isip na bumili pa? waah. I gifted my mom the other lipstick and I am in love with these two shades. I got these for 10900 won for three pesos or 473 pesos. 16. Skinfood Red Orange Makeup Finishing Mist in Matte - I got this for 8000 won or 347 pesis. I think I saw Shaanxoxo used this in one of her videos. This smells so good!!! 17. Skinfood Fresh Apple Poremazing Gel Primer - I got this for 9000 won or 391 pesos at namahalan ako!I should have bought the 3 ONL primers for 12900 won than this!! Ay sus! 18.The SAEM Cover Perfection Pot concealer - I apologize that I forgot to include this on my first draft of this post. This is one of my favorites in this haul. I never planned on purchasing another concealer. As of the moment, I have too much concealers in my stash but I could not resist the price tag of this baby!! 5000 won or 217 pesos only. And my gulay, the coverage?? amazing!! The first time I swatched it in Lotte Plaza I knew I had to to get it. This is currently my everyday concealer. Happy birthday!!!! How generous naman of your fiancee... You are such a lucky woman! So plenty of products, imagined how much you saved in buying those Korean cosmetics.. Oo nga why is it so pricey naman Korean products here in the Philippines... You've got nice choices of your purchases, sulit na sulit! And mind the freebies, andami! Ang cute ng mini bottles!! is that a tonymoly gel liner? thats most superb in ph humid weather! love that thing! i wonder if these mascaras withstand ph weather. how much was the gel liner? love your haul! great photos once again! Yes!! Naedit ko na nakaligtaan ko siya ialagay plus the saem concealer. it is on sale for 4000 won basta 170 something lang siya.. :) Bongga! best month ba talaga ngayon for shopping pumunta sa korea? Pray na sana next year.. :) super saya... nakkaheart attack.. ako naman kasi hindi mpili sa brand kiber kung mura or drugstore sa kanila ang mahala made in korea.. hahaha diba? Omg love this Ms. Donna! Sobrang naexcite ako kasi sa Korea kami this Christmas! Kala ko biro lang yung mga ganyang sale sa Seoul hehe. Ang haba na ng wishlist ko susme!